Set of a scarf, gloves and beanie all manufactured from soft brushed polyester in a drawstring bag. The standard branding position is on the bag with the option to also brand the scarf and beanie if required. The set is available in one size which will fit most people. A lead time of 10-15 working days applies to this product. Colours: Grey, Charcoal, Red, Forest Green, Royal Blue, Navy, Black. Dimension: One size fits most people. Print Description: Bag: 102mm. Scarf: 102mm. Beanie: 102mm x 44.5mm. Print Type: Embroidery. Packing: Bulk. Less than minimum quantities are not available for this item. 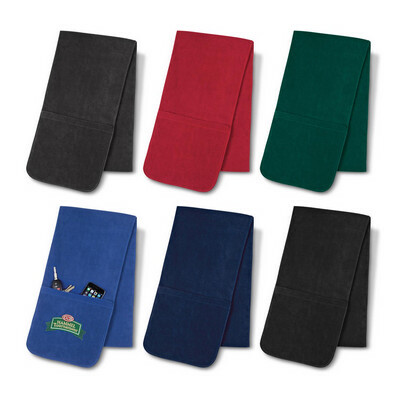 Warm scarf which is manufactured from soft brushed polyester with pockets to keep hands warm or store valuables. A lead time of 10-15 working days applies to this product. Colours: Grey, Red, Forest Green, Royal Blue, Navy, Black. Dimension: L 2000mm x W 250mm. Print Description: 102mm. Print Type: Embroidery. Packing: Bulk. Less than minimum quantities are not available for this item. Two tone scarf which is knitted from warm acrylic yarn complete with a decorative fringe at each end. A lead time of 10-15 working days applies to this product. Colours: Grey/White, Red/White, Forest Green/White, Royal Blue/White, Navy.White, Black/White. Dimension: L 1600mm x 241mm. Print Description: 102mm. Print Type: Embroidery. Packing: Bulk. Less than minimum quantities are not available for this item. 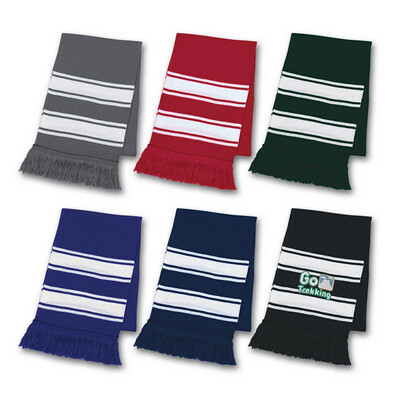 Warm scarf which is manufactured from soft polyester fleece. A lead time of 10-15 working days applies to this product. Colours: Grey, Forest Green, Royal Blue, Navy, Black. Dimension: L 1550mm x 254mm. Print Description: 102mm. Print Type: Embroidery. Packing: Bulk. Less than minimum quantities are not available for this item.